This strike appears as the fourth release in the program which features 99.99% fine silver coins sold at their legal tender face values of $100. 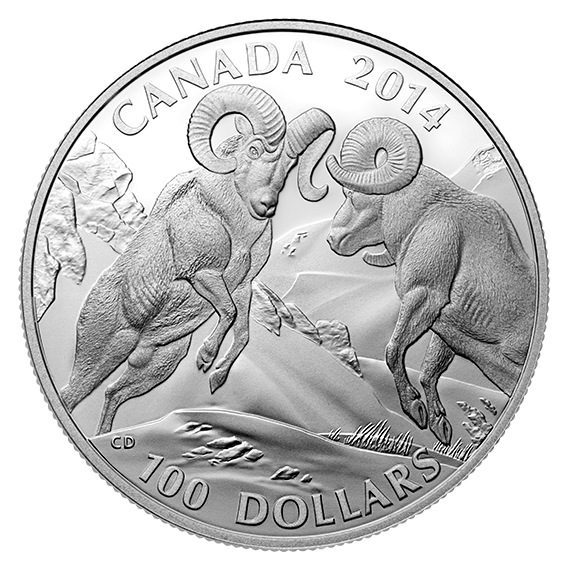 Shown on the reverse of the newest issue is the likeness of two bighorn sheep. "Own this stunning coin in the groundbreaking $100 for $100 series," prompts the Royal Canadian Mint on its website. "Bold design. Expert craftsmanship. Highest-quality silver from the Mint." Coins of the series have proven extremely popular with both collectors and investors with previous issues easily attaining sell-out status. This newest issue is also likely to sell-out as the Royal Canadian Mint indicates over 92% of the mintage of 45,000 has already been sold. 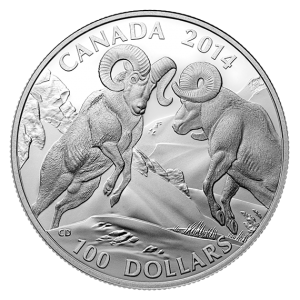 For more information, or to order the 2014 $100 Bighorn Sheep Fine Silver Coin, visit the Royal Canadian Mint website. Orders are accepted via the previously linked website or by calling 1-800-267-1871 (Canada), 1-800-268-6468 (US) or 613-954-2626 (International).